At a recent Women’s Institute for a Secure Retirement (WISER) roundtable addressing strategies, choices and decisions for women’s retirement income, important new data was presented that highlights the challenges faced by women in preserving their 401(k) savings when changing jobs – particularly for women with balances less than $5,000. Compiled by Retirement Clearinghouse (RCH) and presented to the WISER roundtable by RCH EVP Tom Johnson, the data indicates that women with small 401(k) balances cash out much more frequently than their male counterparts. However, as women’s 401(k) balances grow, they become more likely than men to preserve their retirement savings. These behaviors, along with the results of the Auto Portability Simulation, suggest that a program of retirement savings portability could incubate women’s small 401(k) balances, allowing them to more effectively grow their savings to higher balance levels, where more virtuous behaviors prevail. An infographic summarizing the statistics is available for download at this link. Using a multi-disciplinary approach that incorporated industry research on cashout leakage, women’s representation in defined contribution plans, participant turnover rates, the Auto Portability Simulation, the EBRI/ICI 401(k) database and the EBRI Retirement Security Projection Model®, the results provide a model of women participants’ post-separation job-changing and cashout behaviors. Based on Vanguard research, women collectively represent about 40% of all defined contribution plan participants. Each year, an estimated 5.9 million women participants will change jobs. Of these 5.9 million women job-changers, approximately 2.4 million, or 41% will cash out $28 billion in retirement savings, paying taxes and penalties. 2.1 million, or 36% will have balances less than $5,000. Of these, 1.5 million – a whopping 71% — will cash out $2.6 billion in savings. Over a generation, 104 million women will cash out almost $800 billion in retirement savings, in today’s dollars. 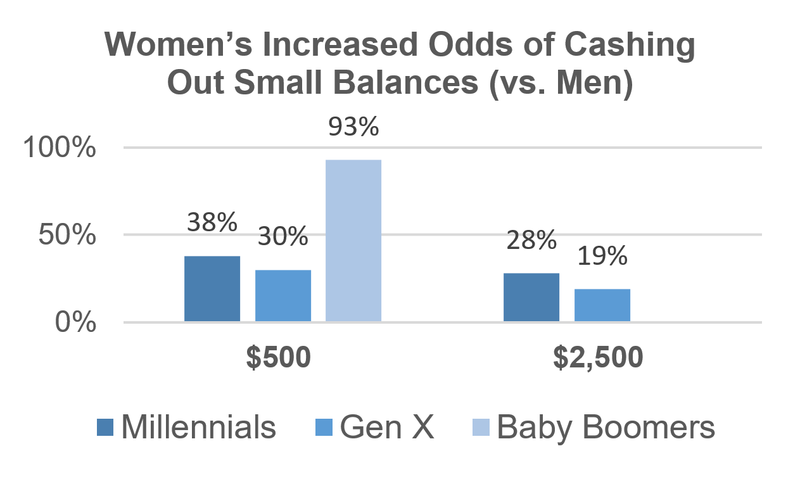 Drawing upon a 2015 survey by Boston Research Technologies, the RCH data also revealed that, at sub-$5,000 levels, women of all ages tended to cash out at much higher-levels than their male counterparts, as indicated in the graph below. A more promising data point was revealed in a 2011 study by Aon Hewitt, indicating that women – at higher balance levels – were more likely than their male counterparts to preserve their retirement savings from job-to-job. This finding seems to mirror other research (ex. – The $10,000 Hurdle, Northern Trust, 2017) suggesting that efforts to move participants’ balances to higher thresholds can act as an effective deterrent to cash outs. In preserving and incubating women’s small 401(k) balances, auto portability delivers. Incorporating the results of the Auto Portability Simulation, the RCH figures show that, on an annual basis, auto portability would preserve the savings of 1 million women participants. Over a generation, 42 million women would preserve their retirement savings, worth about $365 billion in today’s dollars. While the systemic results of auto portability are impressive, its effect at an individual level is equally impactful. The RCH analysis depicts the individual impact of preserving 1-3 $5,000 balances over the course of a career. As the figure shows below, preserving just one $5,000 balance at age 25 can result in $70,000 in retirement savings, whereas three $5,000 balances preserved over the course of a career could result in an additional $123,600 in retirement savings. Taken together, the new data presented at the WISER roundtable demonstrate that by reducing cashouts, consolidating balances and achieving higher balance levels, women could benefit disproportionately from the widespread adoption of auto portability. Tom Hawkins is vice president of sales and marketing with Retirement Clearinghouse, and oversees all key operational aspects of this area, including RCH’s web presence, digital marketing and plan sponsor proposals. In other roles for RCH, Hawkins has performed product development, helped lead the company’s re-branding, evaluated and organized industry data and makes significant contributions to RCH thought leadership positions.